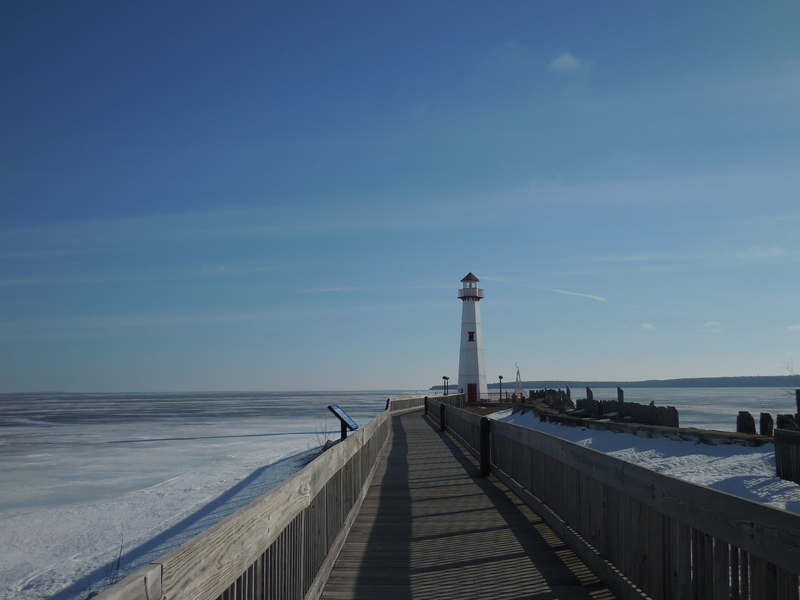 We got an early start on Sunday and parked by the water to take a quick walk down the dock. Once again, we stood solo amongst an empty stretch of snow. 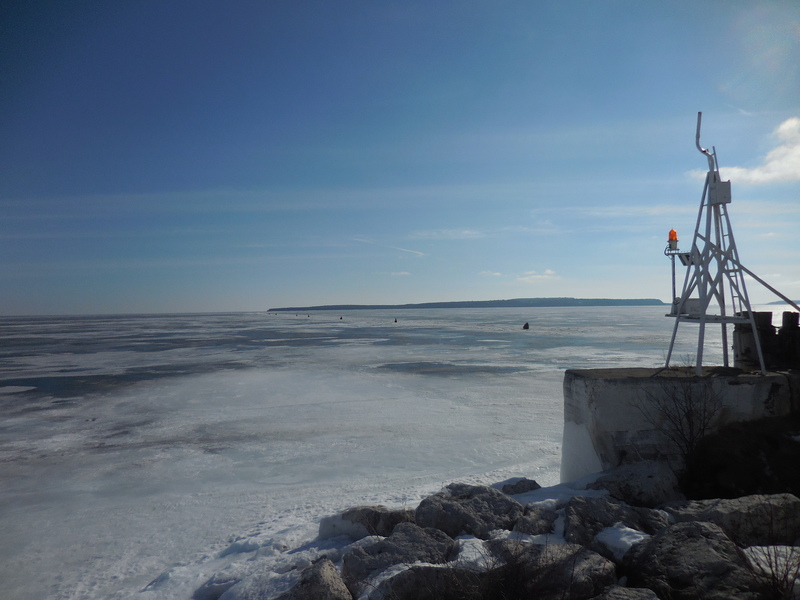 Following lone footprints from some unknown dock-traveler in the deep powder that buried the walkway, we made it to the edge of the lighthouse and took in the view for a few minutes. 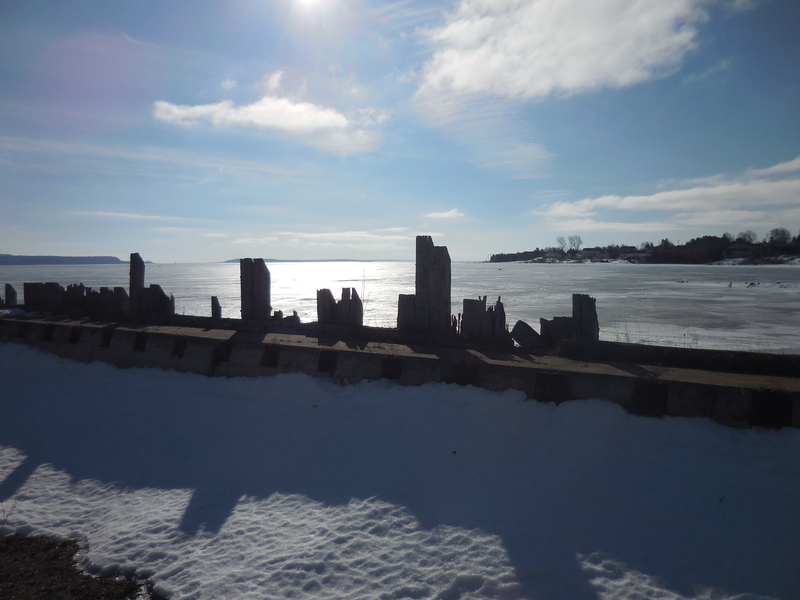 The sun was beaming and felt like heaven, despite the chilly air, and braced us for the long drive ahead. 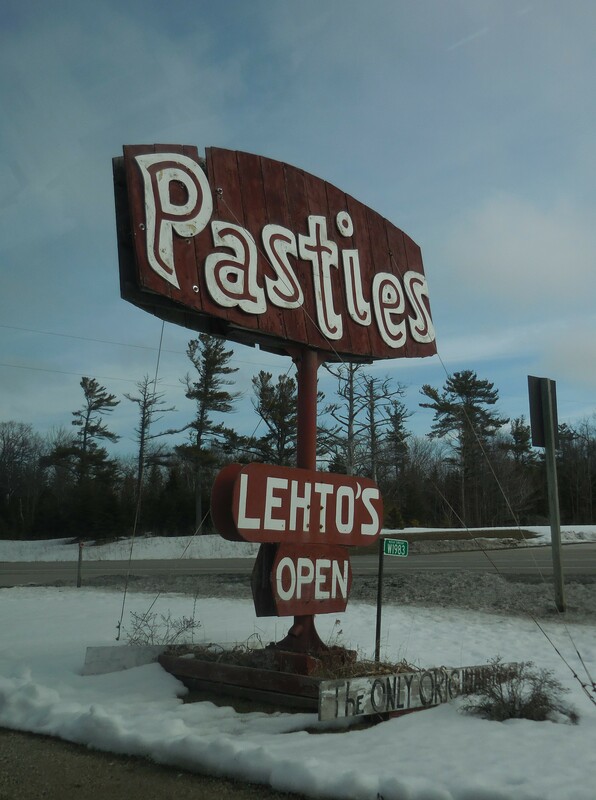 On the road again, we searched desperately for an open spot to buy some Cornish pasties, a meat-filled lunch pastry that is popular in England—as well as in Michigan’s upper peninsula, of all places. 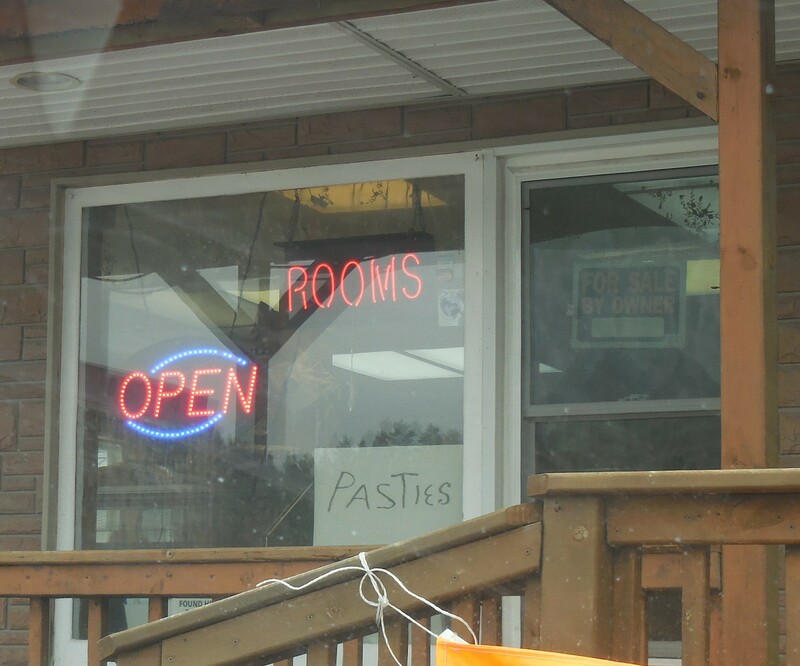 Pasty shops lined the highway, but brandished their “closed” signs like a cruel joke aimed at our empty stomachs. 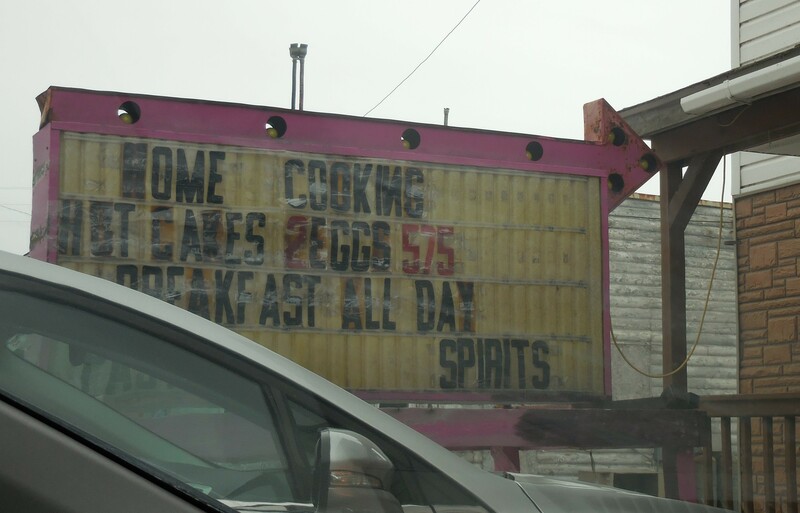 After a brief stop at a “party store” (aka candy store, gift shop, liquor mart and gas station in one) for some Michigan mint fudge, we continued on until I found a listing for “country girl diner” at a nearby town that supposedly served our coveted pasties. We figured that a diner was more likely to be open than one of the tiny wooden roadside shacks we’d been perusing, but we weren’t able to locate this specific address on the GPS or any website (besides a nameless one-page list of pasty locations I discovered by mistake). Undeterred by this odd situation (as per usual), we drove until we were in the general vicinity of said diner and then pulled into a quiet motel-like complex to figure out where we were. As we looked up, we noticed a faded and unassuming sign for “country girl diner” and an arrow pointing towards a very old, very worn down wooden structure with a row of faded coffee mugs in the window. I knew I had to see what was inside, despite Katie’s obvious reticence. The room smelled instantly of old wood, in the same comforting manner as the pages of used books. The walls were lined with photos from decades past, and décor that I can safely assume had been there much longer than I have been alive (…much longer). A group of local older men and women sat around a nearby table, chatting about their families and town events. 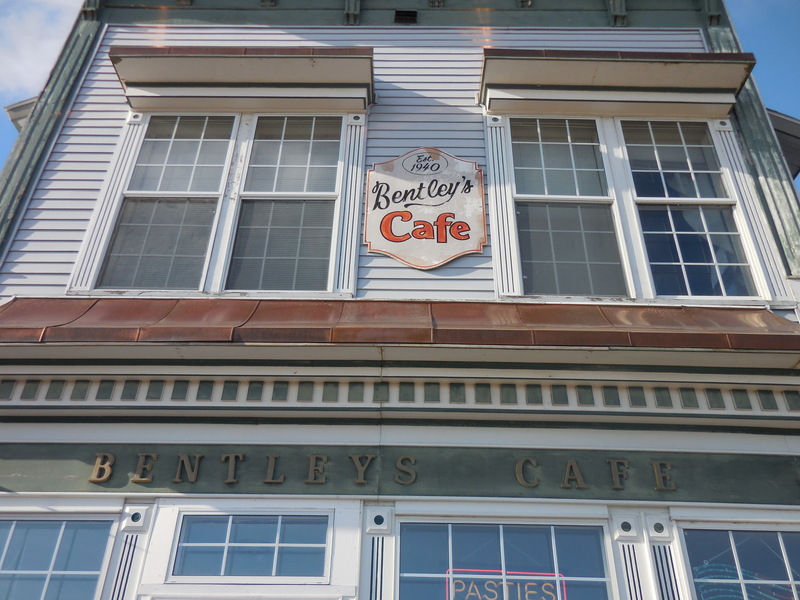 We ordered two of their famous pasties, and lots of coffee. The pasties came out quickly and drenched in brown gravy, which was an interesting deviation from their traditional form. The gravy turned out to be an awesome component, and the chewy dough that surrounded the meat-and-potatoes filling was instant comfort food. It was so filling that I could hardly finish, not that I was rushing to leave my diner frozen in time. You can’t look for places like this, you just have to stumble upon them, completely by accident, when they don’t show up on any of your maps.